soil samples, binders (acrylic medium, egg wash, and gum arabic) , plastic spoons, gloves, zip lock bags, permanent markers, pallets, tape , water and cups. sieves, rasps, sand paper, mortar and pestle, lab note sheet, paintbrushes, and heavy stock paper. Teachers will introduce what pigments are and where to find them through articles such as: Making Paint From Soil , History of Paint , What is a pigment Handout. Student will actively read articles and make annotations. Teacher will have student partner up and do a think, pair, share of the articles. After students share thought with partners then they teacher will open up the class for a group shakeout. Teacher will discuss with students how paint making, its resources, and its industry evolved. Students will watch videos on the process of grinding pigment and adding binders: How to make paint from pigment , Where to find natural pigment, Protecting the worlds rarest pigments. Students will start out at the Science Center and hike the Honey Hill trail to Aleck Meadow. When hiking group gets to Aleck Meadow students will break for lunch and then reconvene to go over lesson instructions. Teachers will first instruct students to pair up in groups of two (teacher will write down names of groups). Teacher will go over how far students can venture when looking for pigments (students should never be out so far that you can't see them). After going over the ground rules, teacher will review with students from the pre-lesson that they did in class where they could possible find pigments. After review teacher will instruct students to find at LEAST 2 different pigments to test. Teacher will explain that pigments can me found in soil, on pieces of wood, in plants such at lichen and moss, flowers, etc. Teacher will then pass out collection materials (plastic spoons, plastic gloves, baggies, plastic bag for carrying samples and sharpies). Students will have 15-20 minutes to explore and collect there pigment samples. After students are done collecting their samples they will gather and do a quick 5-10 minute share out of there findings and their hypothesis as to how they think their paint tests will come out. After share out student will pack up their samples and hike back to the Science Center. Discuss finding at least 3 colors of 'pigment ' reddish (rust color) , a gray /taupe , and an ochre color. If the season is appropriate students could experiment with crushing non poisonous berries to make dyes,inks and paints. Students can perform post lab lesson back in the classroom of the Black Rock Science Center or back at school. Teacher will demonstrate how to properly grind up pigment samples with a mortar and pestle (teacher can remind students of the video they watched before of making paint). Teacher will then instruct students to mix a 1:1 ratio of pigment to binder (ex: one teaspoon pigment to one teaspoon binder). After pigment and binder has been mixed teacher will show how to properly fill in the paint lab note sheet. Students will use the created pigment with the various binders/mediums to complete the exploration chart. After student have experimented with making their paint sample they could use the pigments to create a quick nature study painting either in the area surrounding the Science Center or in the classroom from a photo. Student will present with their partner the paints they created from their samples in front of the class (like a critique). Students should be able to explain where they found there pigment sample (location), what their pigment sample is ( i.e soil, wood, moss, leafs, etc. ), what two binders they used (gum arabic, acrylic medium, egg), and their observations and findings. Other classmates will have the opportunity to give suggestions, comment, and ask questions. Students will collect samples of various soils, rocks, and plants. They will create their own paints by mixing these materials with various binders. We will discuss various types of paint used in Drawing and Paintings throughout history. All paints contain pigments derived from natural resources. 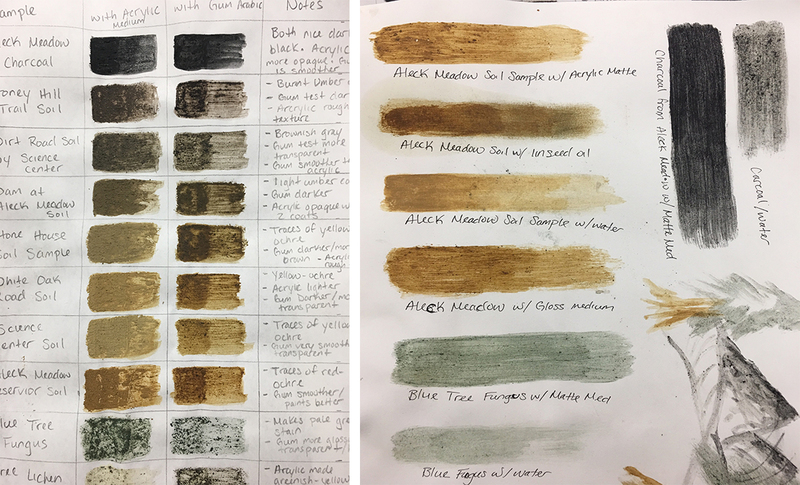 This lesson explores the deriving and direct sourcing of natural pigment possibilities. Students will learn that they are able be able to make paint using pigments from local rocks, soils, and plants. Students will have created paint from materials they sourced. Students will create a chart identifying the pigment source ( i.e. soil, rocks, fungus, berries...) Students will use their paint to create a landscape or nature study on paper. 1) Teachers will introduce what pigments are and where to find them through various articles. Teacher will discuss with students how paint making, its resources, and its industry have evolved. Students will watch videos on the process of grinding pigment and adding binders: The teacher will demonstrate making paint from soil. Light fastness: the rate at which a pigment fades when exposed to light. Heat stability: how pigments react when exposed to heat. Toxicity: the degree to which it can damage a living or non-living thing. Tinting strength: how much pigment is required to produce a particular shade. Opacity or transparency: whether one can easily see the under layers of paint once the top layer is dry. Rationale: Students will understand where art supplies come from and how they are made. By understanding the history of paint making and its process, students will be more aware of the sustainability of pigments in there local area, as well as around the world throughout time. If students know the process as to how to find pigments and make there own paint, then they could use this skill at home in there own backyard. know what you are collecting to grind up. i.e. not bright read poison ivy or sumac berries. When hiking stay in between the two lead teachers do not run in front or stay behind them when hiking the trail.